The HR Source team spent Halloween morning volunteering at one of our member organizations, Northern Illinois Food Bank. While we’ve had a policy for many years encouraging our staff to take a day off each year to volunteer at organizations important to them, it has been a few years since we had the chance to participate in such a meaningful activity as a group. While many of our members rely on volunteers to fulfill their missions, not many have the capacity to handle a group of 30+ on a weekday morning. Once we found one that could, our team enthusiastically embraced the idea of our belated “summer outing” being more about doing good than just having fun. Our visit proved to be a real opportunity to learn about the mission and the operations of Northern Illinois Food Bank. During our orientation and break, we interacted with staff and volunteers and came away with a great deal of knowledge about this 35-year-old organization that is part of Feeding America, a network of 200 food banks around the U.S. 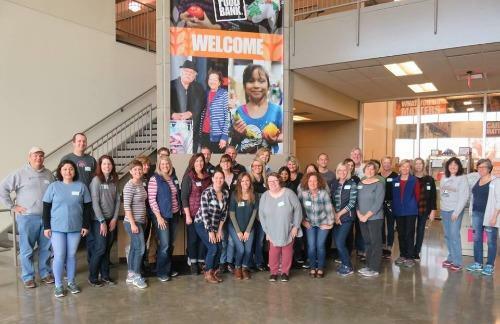 According to Executive Director Julie Yurko, our team was part of a volunteer network of 25,000 unique individuals who contribute 136,000 hours of time each year to this particular Food Bank. This is the equivalent of 60 FTEs which makes an incredible difference to an employer with 120 regular FTEs. We also learned what an important role organizations like this play in ensuring that people have food to eat, especially children and seniors. Northern Illinois Food Bank distributes more than 66.5 million meals annually, in a 13-county region, with the cooperation of 800 partner feeding programs. The HR Source team was assigned to sort and pack potatoes for holiday meal boxes being prepared for Thanksgiving. After a short training session, we quickly dispersed to various stations in the meticulously clean and organized 150,000 square foot facility in Geneva and got to work. At the end of our shift, we were proud to have packed 7,330 pounds of potatoes which will be part of 6,108 meals for those in need. I could not think of a better way to spend Halloween, or any day, for that matter. Our team thoroughly valued the experience of serving together and came away more motivated than ever to give our time and talents to organizations and causes who use volunteers to fulfill their missions. So, if you don’t yet have a policy providing employees with time-off for a “day of service,” I encourage you to consider it. And better yet, think about organizing outings like this, to not only build a stronger team, but make a positive impact in our communities.